Owning a house has become the great Australian dream. If you have managed to fulfil that dream, you might as well make the most of it by creating a beautiful backyard. Unfortunately, the crazy price of land these days, houses – and more specifically their yards – are getting smaller and smaller all the time. As a result, chances are you’ve got limited space to work with. But worry not, for you don’t need heaps of room to make a really nice backyard. Designing your garden’s layout is not something you want to improvise, especially if you’re working with a minimal amount of space. Before you even consider installing those pavers, it’s crucial you draft up a detailed plan for the entire outdoor area. Map out your barbeque areas, flower beds, veggie patches, garden furniture, decks, patios, or any other elements you may wish to include. If you’re not much of an architect, or just strapped for time, consider getting a professional in to help with the process. The end product will ultimately come down to the creativity of your design. Could you squeeze a barbeque into that unused corner? Or perhaps use the underside of that bench as a garden tool storage space? Try dividing the yard up into sections to create a sense of purpose. Diagonal paving tiles such as diamonds are also a winner as they give the garden a touch of extra space. Traditional shrubs and pot plants are all well and good – for those who have the space. If you’re working in a tiny area, then you’re going to need to take another approach to squeeze in as much greenery as possible. The best method is to grow upwards. 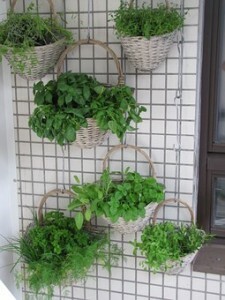 Grab a vertical metal frame from your local nursery and hang some pot plants on the grill. For the best effect, look for vine-like species that love to expand. Before you know it, you’ll have a towering green wall that looks lush, and it will be remarkably unique. Expect plenty of compliments from full-size garden owners when they see how you’ve taken advantage of your limited space. Barbeques and garden furniture take up an awful amount of room, and you may not want them hogging your precious little garden area at all times. The solution is simple; look for pieces which you can move around on a whim. Fold-up wooden tables can still look rather nice, while plenty of pint-sized barbeques come with handy foldable wheels. Letting your trees and shrubs become overgrown will reduce the available space in your yard and leave you feeling a little overwhelmed. Lighten the mood by giving them a good trim every year or so. It’ll keep the plant tame and healthier too. Got a wall surrounding your tiny yard? Then paint it white to create the illusion of extra space. Incorporating a symmetrical design is another way to make your garden feel bigger than it really is. To complement your backyard, if your driveway is looking like it needs some extra care and love, feel free to speak to a concrete specialist at Simply Driveways.